A domain name is the label used to identify and get to your real estate website. For example: yourname.com or yourcity.com. In order for visitors to access your real estate website on the Internet, you must select a unique domain name and register it with an accredited domain name service like AGENT IMAGE™. It’s significant if the key words used to find your site matches your domain name. Some search engines may rank your site site slightly higher if the keywords entered in the actual search for your site match your domain name. 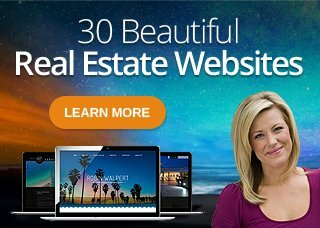 For example, if people who looked for your site often used the term ‘Los Angeles Real Estate’ and you owned losangelesrealestate.com and your site was about real estate, there is a good chance that your site would come up as a top ranked within the search results. However, in general, it’s always a good idea to secure a domain name relevant to real estate, your business, your type of clients, your area or your name. Stick to keywords you think will be most often used to find yoursite. You can also try using the words “real estate” and/or “homes” (i.e. MidCityRealEstate.com or Bevelywoodhomes.com) in the mix when you register your domain name. What kinds of things should I consider when choosing a real estate domain name? The name you choose should be easy to spell, easy to remember and instill confidence. Remember, your domain name will represent your real estate business as much as possible. It’s a good idea for you to try to stick to .com or .net names, as those are the most commonly accepted and trusted by visitors to your real estate website. Your domain name can be up to 67 characters long and can include almost any combination of letters, numbers and dashes. However, use care as complicated or long domain names may break the first rule we mentioned and be confusing and harder to remember. Yes. You can have as many domain names as you like. You can have each domain name point to a different site, or you can have multiple domain names point to the same real estate website. Registering multiple domain names for the same website can help prevent competitors from poaching your potential customers. When picking multiple domain names -or aliases- for the same site, consider variations of your name such as common misspellings as well as both singular and plural versions of the name. Contact an AGENT IMAGE™ real estate design consultant to find out how to register multiple domain names for your REALTOR® website. There is a one-time fee of $50.00 to point an additional domain name to your primary site per additional domain name. How much does it cost to register a domain name and who owns it? Your domain name is registered directly to you and starts at $10.99/year for .coms. Any of our project managers can help register a domain name on your behalf or you can register your domain here: http://agentimagedomains.com/. How long is my domain name registered for? You can register a name for as little as one year, or up to ten or more years. If AGENT IMAGE™ is registering the name, the standard is two years. Discounts are available for longer term registrations. Who pays for my domain name renewal and how do I know when it expires? As the registered owner, domain renewal information is sent directly to you. Renewals are usually sent via email and/or regular mail. However, ultimately, you control the destiny of your domain name. Reminders will be sent to you before expiration, but if you change your email or physical address you may not receive notice and your domain name may lapse. We highly recommend that you keep track of when your domain name expires by adding it to your calendar. Can I use an existing domain name that I have with another company or that is currently not being used? Yes, as long as the original domain name was registered in your name. It usually requires a week to initiate and complete a transfer of a domain name over to our servers. We provide this service for free for your first domain name. How do I transfer my domain to Agent Image? Transfer Domains to Agent Image Transferring your domains to Agent Image can save you time, frustration, and money. You won’t lose any time on your current registration; in fact, you get a one-year extension. Let us keep track of your registration dates, forwards, and services to ensure consistency will your online presence and online marketing efforts. Get all of your websites services under one roof! How do I protect my private information with private domain registration? Private Registration Did you know that when you register a domain, your name, address, email address and phone number are immediately made available to anyone who wants to see them? That’s right. Your personal information is exposed 24 hours a day, everyday, to anyone, anywhere. Are there services to manage my domain’s expiration and notify me when desired domains are available? DomainAlert® Pro DomainAlert® Pro services meet your every need – and your budget. Monitor domain name changes, review the list of expiring domains, and most important of all, backorder domain names so they’re yours the instant they’re available. Worried about your domain names expiring or want a domain name that is already registered? No need to pick up bits of information here and there. No need to constantly monitor the vital information of your registered domains or any others you’re interested in. Why should I transfer my domains to Agent Image? Our customers know us as the friendliest, most service-focused company around. If you have domains with a registrar that just can’t provide the innovative, value-added products and services you need. If you have domains with a registrar that’s provided poor service. If you have domains with a higher-priced registrar. What is my Auth Code or Authorization Code? Authorization codes are unique to each domain and provide an extra level of security. They are assigned by the registry at the time of registration. When you register new .COM, .NET, .INFO, .BIZ, .TV, .US, or. NAME domains with us, we store and maintain your authorization code. Current registries assigning authorization codes are: Verisign (the .COM and .NET Registry), Public Interest Registry (the .ORG Registry), Afilias (the .INFO Registry), NeuLevel (the .BIZ Registry), and NeuStar (the .US Registry). If you want to transfer a domain to us, you need to provide us with the authorization code. You can retrieve your authorization code from your current registrar. We do not have access to your domain authorization code if you did not register your domain with us, but once your transfer is complete, we securely store your authorization code with your domain. If you want to transfer a .COM, .NET, .ORG, .BIZ, .TV, .US, .INFO, or .NAME domain away from us, you access your authorization code from the Domain Manager. What do I need to do to transfer a domain to you? We can accept transfers from any registrar, but each registrar has a different policy for approving transfers. Check with your individual registrar regarding their transfer policy. For example, Register.com sends an email message when they receive our transfer request. You have three (3) days to reply to that email message, either approving or denying the transfer, or register.com automatically denies the transfer. This is a policy of register.com, and we have no control over it. ICANN regulations prohibit transferring domains that you registered or transferred within the last 60 days. If your domain expired and you provide the required authorization, you can submit a request to us to initiate a transfer. When can I transfer a domain name to you? ICANN regulations prohibit transferring a domain name that has been registered or previously transferred within the last 60 days. When a .COM, .NET, .ORG, .INFO, .BIZ, .US, .CC, .TV, .NAME, or .WS domain name expires, it enters a 45-day grace period during which it may still be renewed and then transferred to another registrar. You may not be able to transfer the domain if it is locked with your current registrar, you already registered it with us, the name includes profanity, or it’s privately registered. Some registries restrict the use of profanity in the domain name. Check with your current registrar and new registrar to determine the rules for transferring your domain, and remove privacy before initiating a transfer. Does transferring a domain forfeit time left on the registration period? For most domains, when you transfer your domain to us, we add one year to the existing registration period. When transferring .EU domains, you forfeit any time remaining on your original registration. Your registration for .EU domains expires one year from the date on which you completed the transfer. Once you complete your transfer, you can renew your domain through us for up to ten years.